Can you give more detailed instruction? NCS Expert is ready, cable is working. Slow as a snail, but finally finalizing the parts for the swap.. 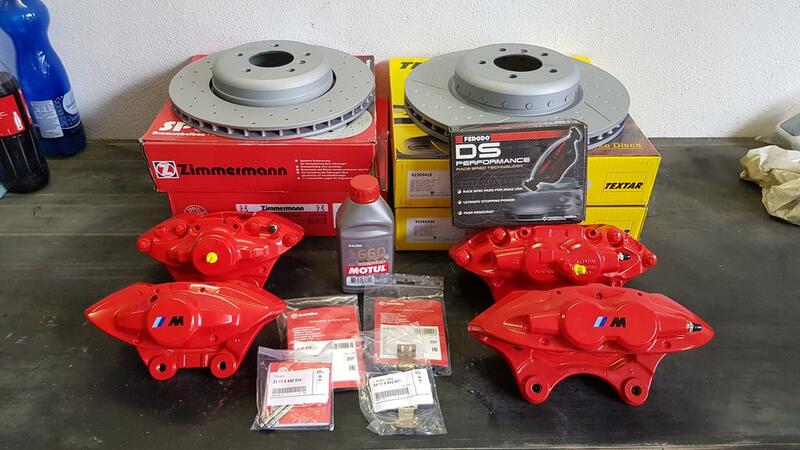 I decided to go with Textar Pro+, currently the best nonOE disks on the market, and Ferodo DS Performance brake pads that have proven to be much better than EBC..
For the rears will unfortunately have to go Zimmermann, they are the only one slotted that I found for the e60..
Can you share part numbers? 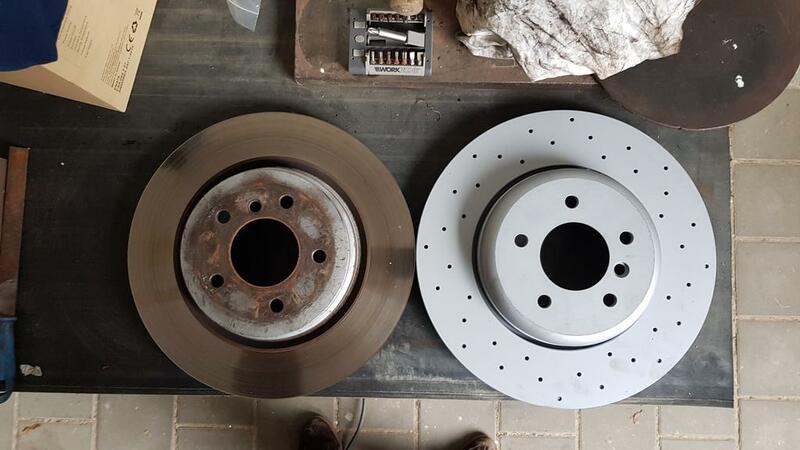 Sure.. the BMW part number for the 370mm drilled/slotted discs is 34106797603, if you decide to go Textar, their internal part number for this disc is 92265425. Looks like Textar isn't available for US. 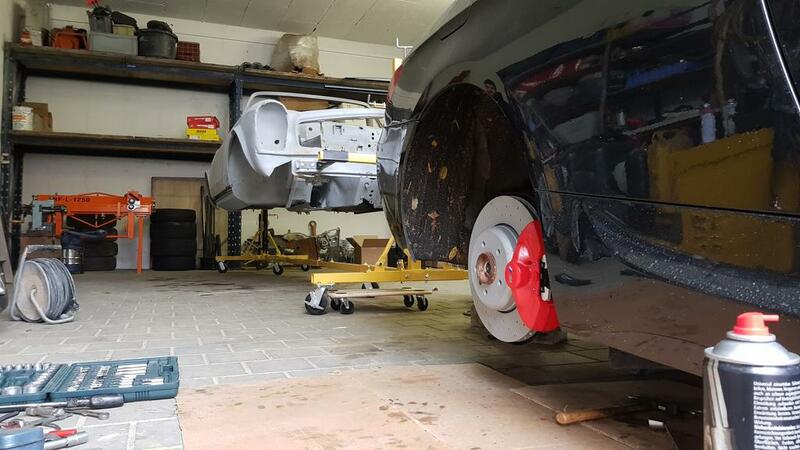 I finally found some time and mounted the fronts, bedded them in and for now it´s a noticable difference, cannot wait to mount the rears this weekend. 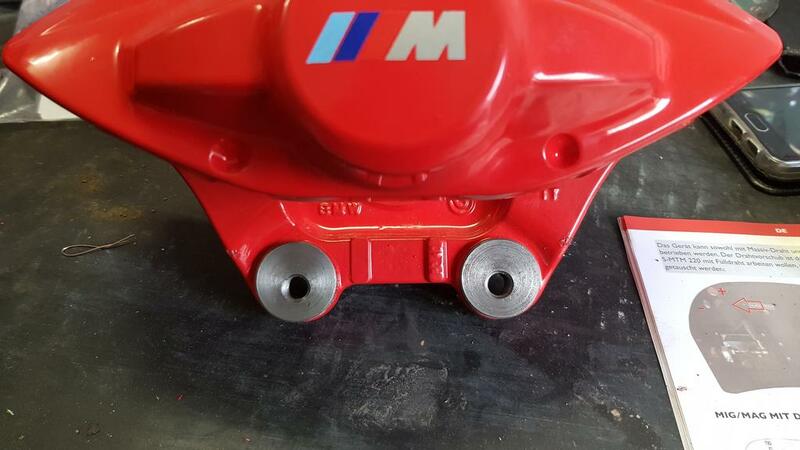 Someone asked before how to best remove the inserts from the rear calipers, well I found that the best way is to screw in a bolt (you can use old wheel bolts) and hammer it out, they come out pretty easily, I used a wooden hammer myself. TBH, I kinda fell in love in my car all over again! Expect more updates of how the rears fit on saturday! You'll have to show us some more of your whole car. Those wheels look good. not much to see there actually, an e92 like any other, slightly tuned..
and some minor work in the interior..
and now finally the F30 BBK, I needed it desperately because I already warped 3 sets of stock discs in 2 years..
P.S. 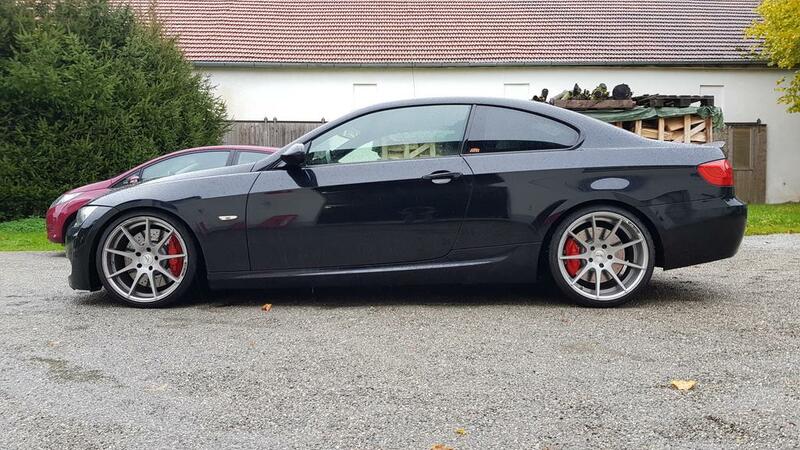 the wheels are Z.Performance ZP08, 8,5x19 et35 and 9,5x19 et35. Last edited by Firechicken; 10-27-2018 at 02:16 AM. 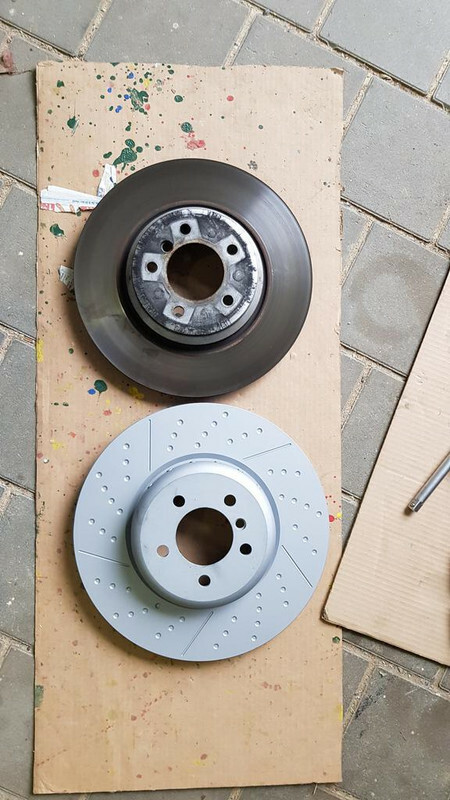 Guys, I´m happy to confirm that this custom bushing/e60 disc works perfectly!! If you got any questions, just shoot! hi, but where do you buy bushings? I bought them from a guy in Germany that usually sells complete kits ready to mount on the e9x.. 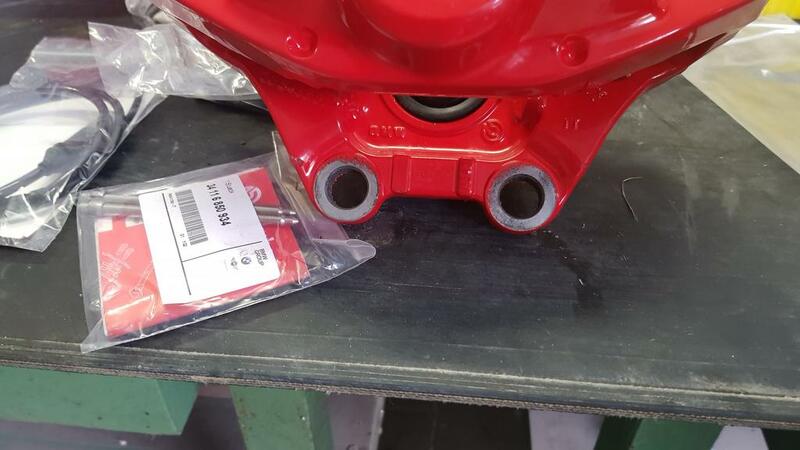 But he is pretty expensive, I would count on at least 150usd for the bushings delivered to the US..
You got the exact dimensions a few pages back, anyone with a CNC or mill machine can produce them for you..
Hi, i need to change my brakes as well. 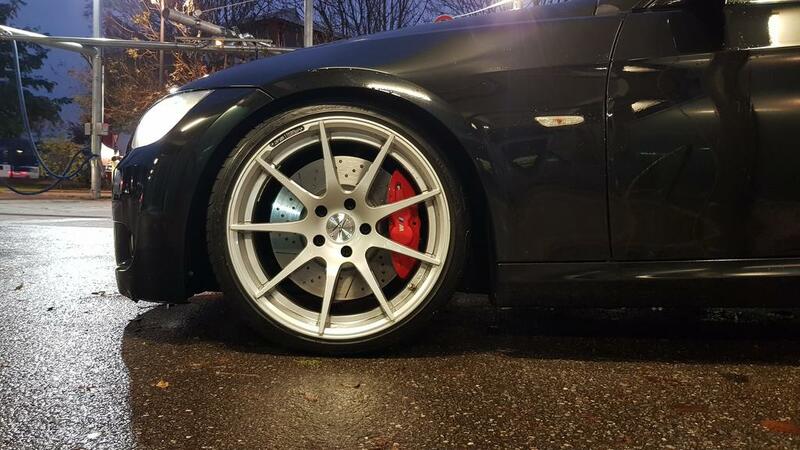 So i can buy just the f30 m pack calipper with the 370mm brake discs and it fits on the e90? And wich brake disc and pads do you suggest? do you have some calippers 370? Just for clarification since reading all 66 pages and many other post is a lot to take in. Can someone clarify if my info is correct. 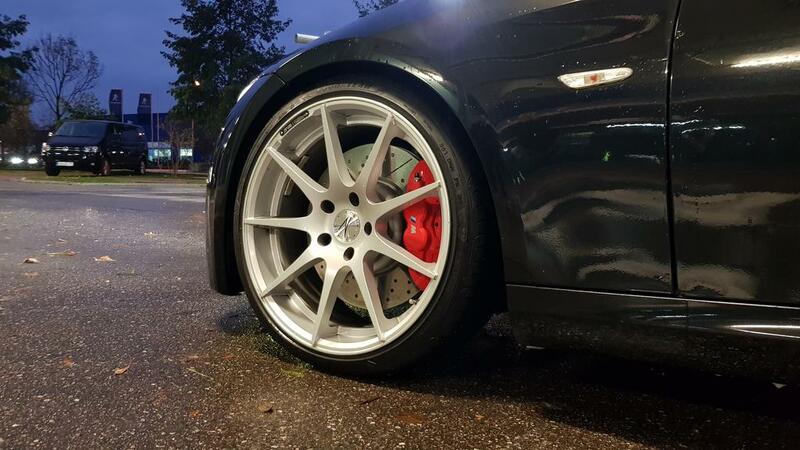 The difference front 4 piston Brembo calipers M Sport with 340mm rotor vs the M Performance with 370mm rotor is due to the mounting offset of the caliper itself. Hence you cannot use the 370mm rotor on a stock(grey) or M Sport 340mm rotor. 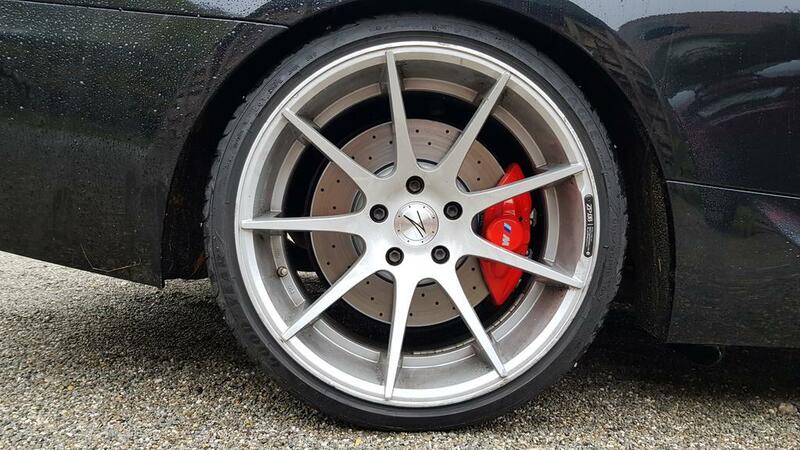 Both the M performance and the F8x M3/M4 use the same caliper mounting offset that allows you to use the 370mm rotor. Note the F8x M3/M4 uses a 380mm rotor. No point in getting the single piston stock calipers. You want the 2 piston Brembos. To mount, you have a few options. 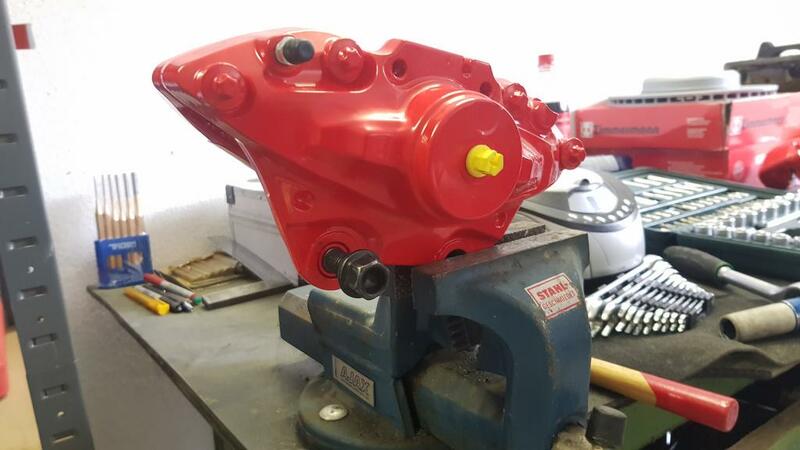 You can either mill the caliper mounting holes so that the caliper and rotor fit in correctly. Refer to Feur post for this. Second is to buy one of the many brackets to mount the caliper on. 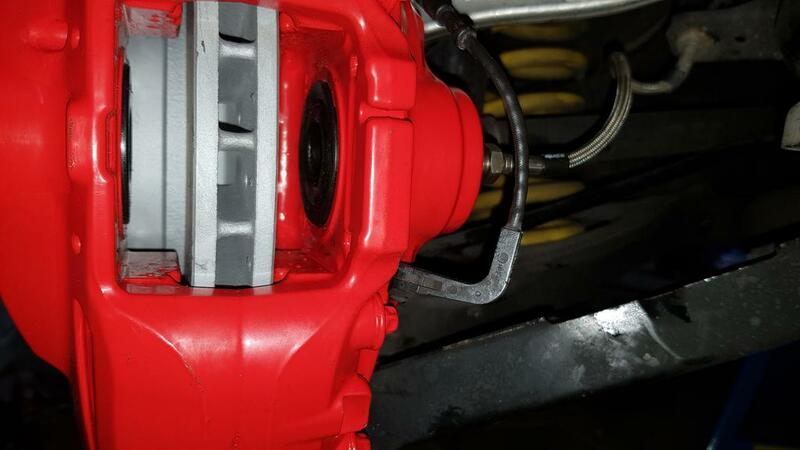 Third is to swap out the mounting hold bushing with an eccentric bushing to accommodate the mounting point change. 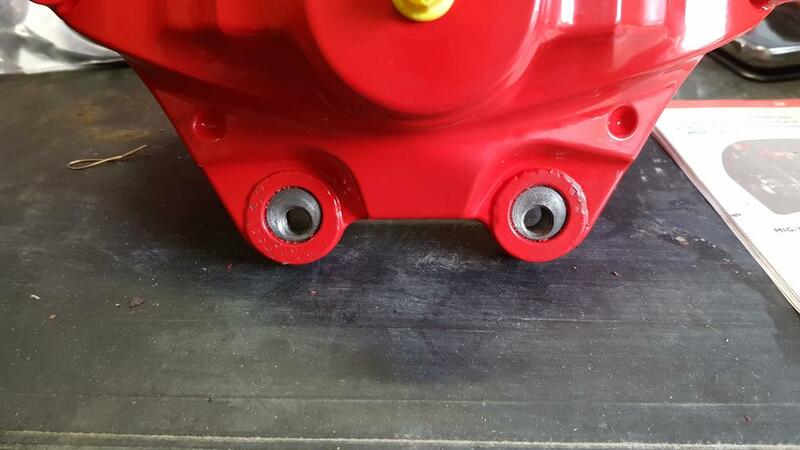 You will be using the e69 rotor as well. When you doppelkaplung you doppel your fun. Additionally the out-of-plane offset for the rear, but only seem to be associated with US models (or US ordered discs), but effort required is reduced by using E60 345's Zimmerman's for the rear but definitely would not center in caliper without modification when I installed them. Attached after versus before rear caliper thickness of rear caliper mounting surface, and required to center up with my setup/car (US E92 328i). Hi guys, sorry it's kind of chaotic the last days @ work, no time to breathe.. I cannot find the ad anymore from the bushing guy but I have his phone number, I'll write him tomorrow and ask if I may give it further on a forum.. 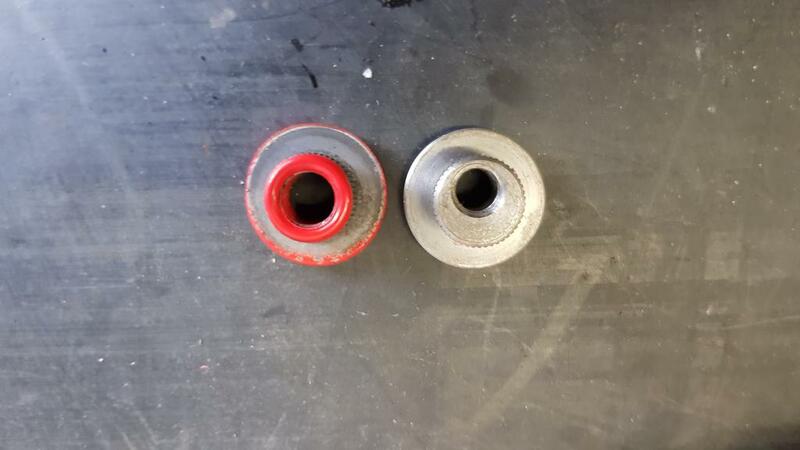 Even though I would recommend the US guys to hammer out one F30 bushing just to be 100% sure of the outer dimensions, and give it to any grease monkey with a machine mill with the dimensions from my previous post, anyone who knows their job can produce them..
10mm is more than enough, even though I believe I'll do 15mm all around, because this just looks awful winter setup ON! 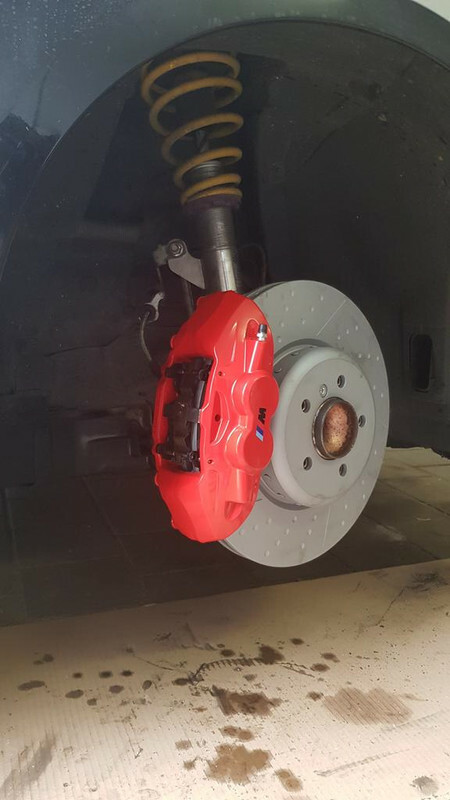 Greetings from Germany guys, if you have any questions I'm here..
hello, I'm Italian, can you explain me what did you do to the rear for the Msport brakes? I'll answer in english so that others also can understand.. I have described everything pretty much detailed a few posts up with pics included. - you have to buy/produce eccentrical bushings like the ones that you see on the pics (a few pages back I uploaded precise measurements), remove the original bushings and press the new ones in, it's pretty straightforward..
Don't forget: you won't be able to use 18" stock e9x wheels any more (only F30 or some aftermarket), and even for the stock 19" wheels you'll need a 10mm spacer on the rears.. 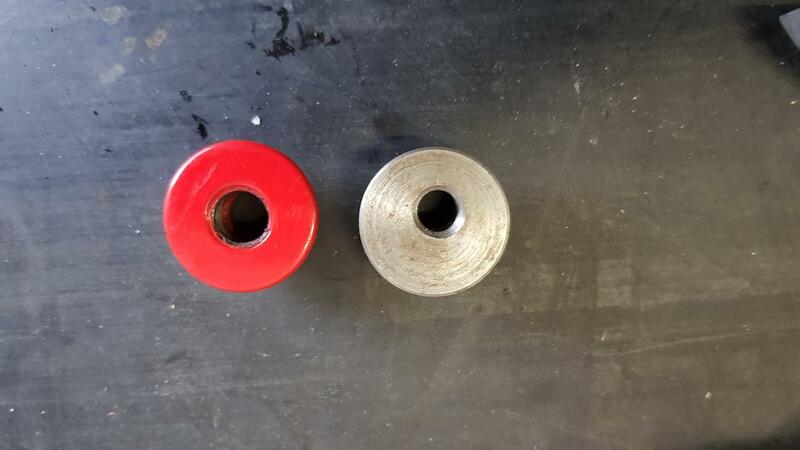 I just spoke with Sebastian, the guy I bought the bushings from, and he is willing to produce more of it and ship it to the US, UK, Italy, Australia or wherever you're from, just be aware that the shipping could be a PITA..
You can contact him via Whatsapp +491737050715, just say that Mihael from the e90post.com forum gave you his number, he speaks german and english, so that communication should not be a problem. Sebastian is cool and willing to help with advices but I beg you not the take advantage of it and suffocate the guy with stupid questions, you have literally ALL the answers you'll ever need in this thread. As always, I am open to help if needed..